She doesn’t like sleeping in her crib, but my newborn sleeps in her stroller all the time. At first my wife and I thought our stroller would be a just a way to transport Arya around the city. Now, in addition to carrying groceries and clearing a path on crowded sidewalks, our stroller has become the favorite sleeping spot for our newborn baby. Arya loves sleeping in her stroller while outside, but she also loves falling asleep in her stroller even while at home. Our baby stroller isn’t particularly comfortable since it costs more than $1000 less than fancy strollers. The shoulder straps are also too wide for Arya forcing us to over-tighten the belts. She will eventually grow big enough to fit perfectly in the straps, but our stroller will still be cheap. Thankfully we didn’t have to go through many different strollers to find one that our newborn likes. I have no problem with the craftsmanship of our stroller. But when we were shopping for strollers pre-Arya, we got to feel the materials used in high-end strollers and all of them were more comfortable than our bed. So while Arya’s stroller is perfectly adequate for its intended use of pushing her around the city, I do not consider it a great place to sleep. My baby disagrees. My newborn sleeps in the stroller every chance she gets. Whenever we go outside the house she falls asleep within minutes. Whenever we come home she stays asleep until she gets hungry. She even sleeps in the stroller while wearing weird hats and cute baby outfits that make her sweat outdoors. Since Arya hates sleeping in her crib we’ve had to find different sleeping arrangements for her. The stroller has always been our last-resort option for putting her down for her nap. We have been hesitant to use the stroller as an exclusive sleeping spot. The stroller takes up too much room in our small apartment to consider leaving it in the unfolded position all the time. It’s also hard to watch our baby when she is in the stroller due to the protective mesh and enclosed design. We also know she shouldn’t routinely sleep in her stroller due to safety concerns. We’re paranoid about SIDS and like being able to check on our baby while she sleeps. The design of the stroller — while great for walking about town — is not conducive to watching a sleeping baby. 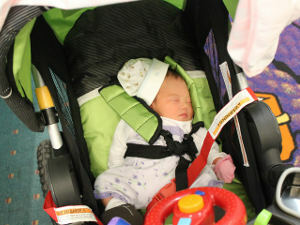 The stroller restraint system also prevents our newborn from moving around. This is obviously great to keep her safe outside, but may limit her development if she were forced to remain in it every time she slept. We use the stroller as a way to calm our baby and put her to sleep. Once she is in a deep sleep, we slowly unbuckle her and carry her out of the stroller. Although we’ve accidentally woken her up a few times, we’ve now gotten better at estimating baby sleep cycles and can now move her without waking her. I expect baby to eventually grow out of her sleeping problems. Until then, I can count on the fact that my newborn likes sleeping in her stroller.